SEASIDE HEIGHTS – Once-familiar roars and delighted screams returned to Seaside Heights this weekend, nearly five years after Casino Pier's iconic Jet Star roller coaster was torn from the pier by superstorm Sandy and fell into the Atlantic Ocean. It has taken that long for a comparable coaster to come back to this boardwalk, which was devastated by the storm and then hit with a second disaster when the boardwalk caught fire and Funtown Pier burned into ashes and memories. On Sunday, thrill seekers from across the region braved the windy, cold and overcast boardwalk to be some of the first to try the new Hydrus, a swirling green track on the north side of Casino Pier. "It was really good," said Bret Ulozas, the New Jersey region representative of the American Coaster Enthusiasts. "It's very smooth... I rode it like five times." The coaster includes a 97-degree drop, includes three inversions and reaches speeds of 45 mph, said Ken Taylor, assistant director of operations for Casino Pier. It sits not far from where the Jet Star plunged into the Atlantic when the storm ripped apart the pier's eastern end. That roller coaster became an icon of Sandy's damage; photographers captured the unique site of its twisted metal in the months it sat in the surf. "We can almost turn the page on hurricane Sandy in that there was always something missing," said Taylor. "The iconic piece in the water has finally be replaced by a new iconic piece." Hydrus is the first of three new attractions to be unveiled this season. Casino Pier's new 131-foot Ferris wheel is scheduled to open before the summer season begins and the pier is also preparing to install a massive three-lane slide. But the Hydrus' 1,000-feet of serpentine track is the most attractive to the adrenaline-loving of visitors. "It was so much fun," said 12-year-old Marlee Card of Point Pleasant, who rode with her brother Tyler Manguno and stepmother Kristy Manguno. "It doesn't seem that high but once you go in it, it's like 'whoa,'" Marlee said. "It was great. I didn't expect it to be as much fun as it was," said Kristy Manguno. A ride on the Hydrus is 10 credits, or $10. Darla Mattei of the Bayville section of Berkeley tried the coaster while her husband and 4-year-old son watched from the boardwalk. "I was kind of nervous that it (the boardwalk) was just going to crumble (after the storm and fire), that nothing was going to get back to the way it was," said Mattei, who grew up in Seaside Park. 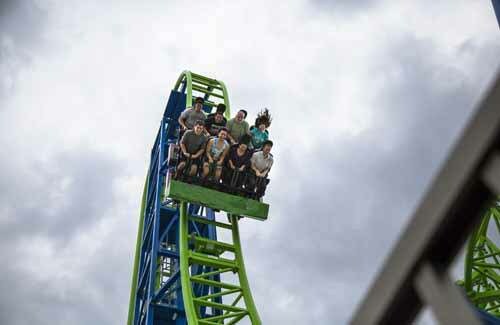 "We were excited to see this (roller coaster) open," she said. That excitement was echoed by 13-year-old Mia Kelly of Bayville and her friend Gianna DeSilva, 13. Both braved the Hydrus Sunday and said it was one of the best attractions on the boardwalk. "I've been coming here since I was little, so it's nice to see the pier getting built up again with the rides," said Gianna's mother Angela Gatnarek. "It feels a little more back to normal now." That old definition of normal, the pre-Sandy normal, is what Taylor, assistant director of operations for Casino Pier, wants to see this summer. "More people are coming back," he said. "It's exciting."